YOU'VE HEARD IT A MILLION TIMES: You need calcium to prevent osteoporosis. But a lack of this mineral means more than weak bones, says Robert P. Heaney, M.D., a calcium researcher and member of the Osteoporosis Research Center at Creighton University in Omaha, Neb. Key organs and bodily functions, like your heart and metabolism, need calcium to operate at their best. Yet only 21 percent of us are getting the recommended amount of calcium, according to federal government statistics. Here are five important but little-known ways that getting more calcium can improve your health. Calcium helps keep the weight off. Research suggests that if you don't get enough calcium in your diet, you're likely to be overweight, Heaney says. Of course, it's possible to be overweight even if you do get plenty of calcium, but Heaney points out that an adequate supply appears to make it easier to maintain a healthy weight. The reason has to do with your body's response to a calcium deficit. When you're low, your body thinks you're starving and enters emergency mode, releasing parathyroid hormone from four glands in your neck. This hormone stimulates your bones to release some calcium into your bloodstream. Your kidneys also deliver a dose of a hormone called calcitriol, a form of vitamin D, to increase your ability to absorb calcium. The trouble is that parathyroid hormone and calcitriol also stimulate the production of fat and inhibit its breakdown. As a result, your body stores fat and holds on to it stubbornly, even if you're on a low-calorie diet, explains Michael B. Zemel, Ph.D., head of the department of nutrition at the University of Tennessee at Knoxville. On the other hand, a high calcium intake suppresses these hormones so your body stores less fat and also breaks it down easily, he says. In his research, Zemel found that calcium from low-fat or nonfat dairy products was more effective for weight loss than any other form. If you're low on calcium, researchers say, you're more likely to have high blood pressure. Your body releases the hormone calcitriol in response to a calcium shortage, and calcitriol acts on the smooth muscle walls of your arteries, constricting them and elevating your blood pressure, says Heaney. In fact, your calcium intake may be almost as important to blood pressure as your sodium intake, says Gene Spiller, Ph.D., the director of the Health Research and Studies Center in Los Altos, Calif., and co-author of Calcium: Nature's Versatile Mineral (Avery, 2000). He explains that an adequate supply of calcium helps muscles--including your heart muscle--do their work of contracting and relaxing. Calcium also appears to help your nervous system regulate the level of pressure in your arteries. The benefits of calcium on heart health were confirmed in the Dietary Approaches to Stop Hypertension (DASH) study, published in the New England Journal of Medicine in 1997. The study found that a healthy diet that included two to three servings a day of low-fat, calcium-rich dairy foods like yogurt reduced systolic blood pressure by 5.5 points more than the control diet, and reduced diastolic blood pressure by 3 points more. "We don't want to oversell the importance of calcium [for heart health], because it's only a part of the puzzle," says Heaney. "But it's a very useful part." A 1998 study led by Susan Thys-Jacobs, M.D., of St. Luke's Roosevelt Hospital in New York City, found that getting enough calcium can ease the symptoms of premenstrual syndrome (PMS). In this study of 497 women, published in the American Journal of Obstetrics and Gynecology, half took 600 mg supplements of calcium carbonate twice a day, while half took a placebo. The women who took calcium experienced significantly fewer symptoms in two months and improved even more after three months. The explanation comes down (again) to calcium-regulating hormones. Your body suppresses the hormones if your calcium supplies are adequate, but releases these hormones if you're not getting enough. Women who suffer from PMS appear to have elevated levels of these hormones during their menstrual cycle. Thys-Jacobs explains that it's no accident that some of the symptoms of PMS, like cramping, irritability, and depression, are similar to the symptoms of a calcium-deficient state. The good news for PMS sufferers is that consuming calcium appears to ease most of the symptoms. "We found that calcium is effective both on the emotional and physical side," Thys-Jacobs says. "It has a major effect on irritability, cravings, mood swings, breast tenderness, and other symptoms." Calcium protects against colon cancer. Adequate calcium intake may reduce your overall risk of colon cancer and suppress the growth of polyps that can lead to cancer. Researchers don't know exactly why this happens, but Heaney says it may be linked to the excess calcium that's left in your intestines after your body absorbs what it needs. On its way through the colon, this unabsorbed calcium is believed to bind with cancer promoters so they're excreted together from the body. Studies have shown that both food sources of calcium and calcium supplements provide this protective effect. Calcium protects your teeth in an indirect way. Your teeth themselves are relatively inert, meaning that the calcium they contain usually stays there. Your jawbone is the potential problem. Like other bones, it gradually surrenders calcium for needs elsewhere in your body if you're not consuming enough. As your jaw weakens, your teeth loosen, creating gaps where bacteria can invade, triggering infection, inflammation, and bleeding. In fact, the condition of your teeth and gums can be a window to the overall health of your bones, says Bonnie Bruce, R.D., D.P.H., M.P.H., a registered dietitian and a research director in immunology and rheumatology at Stanford University in Stanford, Calif.
"The first signs of osteoporosis are sometimes found by a dentist, because something is happening to the structure of the jawbone," Bruce says. Talk to your health care practitioner if you experience the unexpected loss of a tooth or your teeth start to feel loose. Sufficient calcium intake can prevent these problems in the first place. Which Foods Provide the Most Calcium? Osteoporosis Research Center at Creighton University in Omaha, Neb., say low-fat or nonfat dairy products, including yogurt and milk, are an ideal way to get your calcium because they're inexpensive and easily absorbable. growth hormone with an uncertain safety record. an inability to digest milk sugar, is common. rBGH-free. No matter what your decision on dairy, get to know the full range of calcium-rich foods. RESEARCHERS RECOMMEND THAT YOU GET this amount from a combination of food and supplements. Don't consume more than 2,500 mg a day in supplement form; this may increase your risk of kidney stones. If you have hyperparathyroidism or a history of kidney stones, talk to your doctor before taking calcium supplements. Which Calcium Supplement Should I Take? SUPPLEMENTS MADE OF CALCIUM CARBONate are easy to find and inexpensive, but they should always be taken with meals for best absorption. Calcium citrate supplements can be bulkier and more expensive than other supplements, but they are well-absorbed and can be taken at any time, with or without meals, says Bess DawsonHughes, M.D., professor of medicine and chief of the Calcium and Bone Metabolism Lab at the U.S. Department of Agriculture Human Nutrition Research Center on Aging at Tuffs University in Boston. In this case, it may be better to choose synthetic supplements over naturally derived ones. A study detected lead in some supplements made from oyster shells, the mineral dolomite, and bone meal. Dawson-Hughes says the lead in those supplements was far below dangerous levels. "Having said that, the less consumed, the better," she says. Can Calcium Increase a Man's Risk of Prostate Cancer? A STUDY OF MORE THAN 20,000 MEN CONDUCTED at Harvard Medical School in Boston found that those who consumed the most calcium and dairy products had a 30 percent greater risk of prostate cancer than those who consumed the least. These results don't mean men should eliminate dairy and calcium supplements from their diets. Harvard researcher Edward Giovannucci, M.D., D.Sc., believes the recommended daily intake of 1,000 mg "is reasonable for now until we know more about prostate cancer. However, it may be prudent not to exceed this level substantially." 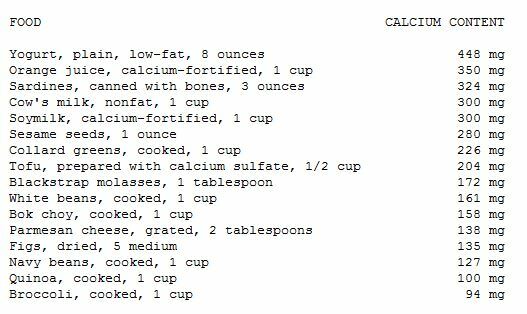 How Can I Boost My Calcium Absorption? * DO GET ENOUGH VITAMIN D. This vitamin helps transport calcium across your gut to the rest of your body. If you live in a sunny region, you can get vitamin D by spending 15 to 20 minutes in sunlight two or three times a week. If you live elsewhere, make an effort to eat vitamin D-fortified foods like cereal and soymilk. * DON'T CONSUME MORE THAN 500 MG OF CALCIUM AT A TIME. Your body can only absorb so much of this mineral at once. * DO TAKE ONE DOSE AT NIGHT. Your bones lose some calcium while you sleep; a nighttime dose may minimize the loss. * DON'T SMOKE CIGARETTES, AND DON'T OVERDO SODIUM OR CAFFEINE. All three are thought to reduce calcium absorption.